Plant one into a container with English ivy at its base. Display a single plant where its simple beauty can shine uncluttered. Group several of them together, but each in a sleek pot of a differing height. Tuck one into a seasonal centerpiece. Choose different bloom colors to suit the season, your decor colors or your mood. Place some among broad-leaved plants that serve as a backdrop for the rose blooms. The majority of an indoor rose's daylight hours should be in bright light for all of the buds to burst into beautiful bloom. Don't be afraid to shift it to the dimly lit dining room as a centerpiece for the evening, just place it back in the light during the day. Allow the soil surface to dry before giving a thorough watering. Avoid getting water on the leaves. Once blooming stops or you simply tire of them, miniature roses are inexpensive enough to be disposed of without feeling guilty. Re-bloom is possible, but requires supplemental lighting, pruning, fertilizing and a dose of luck. 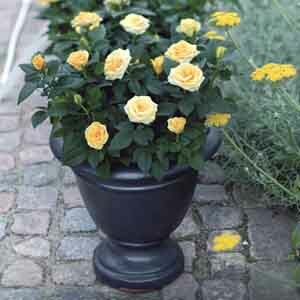 If you decide to keep your miniature rose, repot it in a slightly larger container with fresh potting soil. You can keep your rose plant displayed indoors or move it outdoors when the weather is warm. If temperatures stay above -20°F (-29°C) in your area, then the rose may be planted in the ground and should survive over the winter. Have you had success with growing mini roses? Share your tips for success in the comment section below. An assortment of beautiful plants that will grow well under indoor conditions. Topiary is a fun way to add plants that suite your style within your home and ivy is a relatively forgiving, easy-care, starter topiary plant. 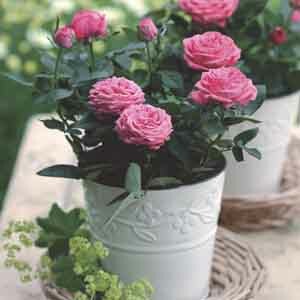 Flowering potted plants are a quick way to add color, freshness and a designer touch to interiors.